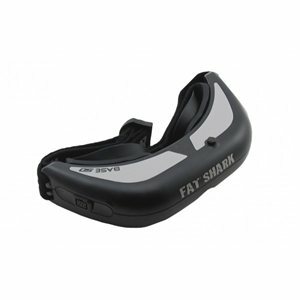 Fatshark Base SD FPV Video Goggles . The Fatshark Base SD Goggles are built for serious FPV First Person View Pilots, the new BASE SD goggle is the only choice for tethered video piloting. The Fatshark BASE SD has dedicated tooling for a smaller, sleeker profile and are the lightest video goggles anywhere (110g). The controls are minimal which makes getting out flying much easier (brightness/contrast) to ensure years of reliability. The Base SD have a new 35 degree FOV Field Of View display strikes a perfect balance between large screen immersion and compact pixel density clarity. The Fatshark BASE SD sports the same polarized backlight technology used in the gorgeous Dominator display for vibrant colors and has adjustable IPD for dialing in the optic sweet spot so you can be assured of excellent picture quality. The FATSHARK BASE SD FPV pedigree is evident from the FPV specific features that are not found on common video glasses such as high pass filtering to remove video noise from 433Mhz and 2.4Ghz UHF radios and a video sync tip signal conditioner to tolerate poor video inputs resulting from mixed component and wireless setups. The IPD sliders have tactile feedback and the secured rubber eye cups completely block out ambient light. For a Base Station FPV goggle, there really isn’t anything else that can compare.